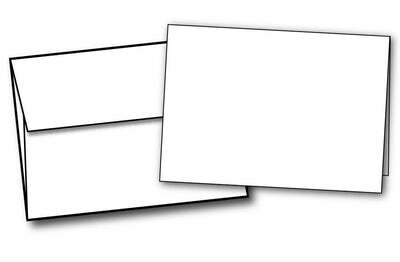 Sheet Measures - 7" x 4 7/8"
White Folding (4 7/8" x 3 3/8") Note Cards & Envelopes are perfect for creating your very own note cards or thank you cards. The greeting card paper, made from 80lb cardstock, measures 4.875" x 7.75" and folds to 4 7/8" x 3 3/8". The matching A1 envelope is made from a quality 24lb bond stock - perfect for holding the contents inside! Both inkjet & laser printer compatible.